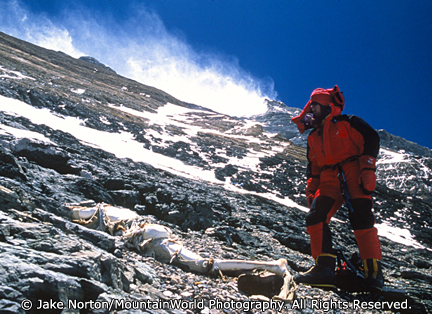 Nine years and 14 days ago, my teammates had an amazing day: we discovered the 75 year old remains of George Leigh Mallory at 27,000 feet on Mount Everest. There were many things that happened during the expedition’s prior 6 weeks that led to that amazing success: teamwork, planning, and of course some luck. But the most important thing was a team-wide ability to think outside of the box, to approach a huge task a little bit differently, and to empower each member of the team to do the same. Take, for example, the genesis of the expedition as a whole. Eric Simonson, our team leader, had to think outside the box from the start. An experienced and successful commercial outfitter on Everest, Eric could have simply gone back to Everest with the same model: bring clients, get them up – or not, and cash a paycheck. But, instead, he had a vision – a vision that went against all the norms and standard practices of Everest climbing – and saw that vision through. True outside the box thinking and action. Another example of both components is Eric’s choice of team members. With the exception of Conrad Anker, none of us were regulars on the pages of Climbing Magazine. Dave Hahn, Andy Politz, Tap Richards, and I weren’t out making bold first ascents in remote areas. But, we were passionate. We were dedicated. And, together, with Eric’s and team historian Jochen Hemmleb’s leadership and vision, we pulled off what to most seemed impossible. Today in my inbox I found my weekly copy of Knowledge@Wharton, the weekly newsletter of the Wharton School of Business an the University of Pennsylvania. In this issue was a wonderful interview with YashoV. Verma, Director of Human Resources for LG India. Verma’s interview and comments resonated with me, echoing much of what I mentioned above and know to be true harbingers of success from my years in the mountains. And, his comments rang even truer given the success LG India has seen through using these methods: the industry leader in India with control of 30% of the market share. Verma began by affirming that LG India’s business model has always been "absolutely non-traditional." He expanded, saying: "Anything that is not in the management book…we have done it." LG India’s approach to business has always been outside the box, and has proven the most successful model in the field. Verma also talked about what he and his team look for in recruits. Traditionally, a top manager would come from the ranks of other top managers; HR recruiters would look for a deep background of knowledge and experience. Verma, however, took the opposite track. Knowledge is something which can be learned. But it is passion, it is attitude and the will to succeed which is much more important. These are the 3 qualities we look for in recruits. Passion. Attitude. The will to succeed. Simple, yet often forgotten as the essential fodder for success…in business or in the mountains. What box do you need to think outside of? Do you and your team have passion, attitude, and the will to succeed? Or just knowledge and experience? – Jake Norton is an Everest climber, guide, photographer, writer, and motivational speaker from Colorado. Really good article. I have been following your blog for last 3 months. You have good knowledge on Mobile(cell phone) Industry and happenings. Please continue the good work. Thank you.